Right now, there’s a perfect storm brewing for tea. Demand for global flavors, especially Asian, is growing; interest in health and wellness is booming; tea has a high profit margin at a time when food costs are skyrocketing; and adoption of tea by Americans is surging forward. In fact, according to the U.S. Tea Association, the tea market has grown from $1.8 billion to $10.4 billion in just over 20 years. In tune with tea’s potential, Starbucks CEO Howard Schultz last March said that tea was “ripe for innovation.” And Starbucks plans to grow Teavana tea stores across the country and abroad as part of a five-year plan Schultz detailed in December. Like it’s done with coffee, Starbucks upsells its teas by combining them into lattes, smoothies, fusions and sparkling iced drinks. Smaller players are doing the same, using on-trend teas such as matcha, rooibos and cascara to create profitable beverages with little added food cost. Some 15 percent of customers who visit SubRoc’s 17 locations order the Green Tea Matcha Frappe, says Marc Graubart, owner and founder of the deli franchisor. With a 75 percent profit margin, the item wins with customers on several counts, including its healthy quality, he says. To increase purchases, SubRoc uses the frappe as a promotional item when guests order a sandwich or salad (buy X, get a frappe for free). “Once they try it, they usually order it again,” Graubart says. The frappe is priced from $1.99 to $3.99, depending on the size (12, 16 or 20 ounces) and it’s made by blending milk, ice and matcha tea powder. Frappes are on the menu year-round at the casual Cafe Fulya in Philadelphia. In warmer weather, its Green Tea Frappe and Blueberry Green Tea Frappe make up 10 percent of sales. Cafe Fulya owner Tristan English also finds that adding tea to fruit juice is a way to build profits. The restaurant already sells juices popular in Turkish cuisine, such as apricot, mango, peach and sour cherry, for $2 and $3. For an additional 50 cents (and an 80 percent profit margin) guests can have a cold tea-juice blend, such as raspberry-hibiscus tea mixed with peach juice or lemon-ginger tea with mango juice. “Each day we switch to a different tea with a different juice,” English says. But guests can order any combination they wish. Health and innovation are selling points at the two locations of Kansas City, Mo.-based Parisi Cafe. Rooibos tea is the base for its cold-weather Honey Cinnamon Tea Latte, while cascara tea goes into its housemade soda, Cascara Cola. 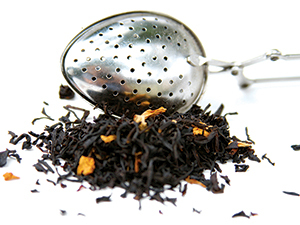 Both teas are high in antioxidants—a selling point for the cafe. Cascara Cola is a case in point. Blackman developed the housemade soda by boiling together orange peel, nutmeg, cinnamon, cascara tea and water; she adds sweetener and boils it again to make a syrup. At the cafes, servers simply mix the bottled syrup with sparkling water to order. The drink sells for $3.10 for 16 ounces and $3.40 for 24 ounces, with an 80 percent profit margin. Sales were high when the cola debuted last summer, Blackman says, and it will return to the lineup in the warmer weather. Cascara tea only has been around for three or four years in the U.S. “Making it into a cola is a good way to get people to try it—attaching something unfamiliar to something familiar to get it out there,” says Blackman.